“Lakerbots” prepare their robotic design for competition. When their regular day of classes is over, a small group of Triangle Lake Charter School students head for the shop building to work on an extracurricular team project – designing a robot that can compete in a predetermined challenge. 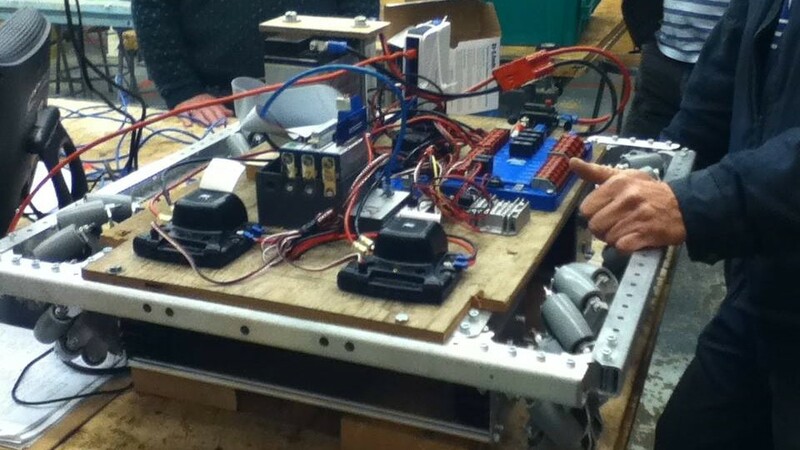 They call themselves “Lakerbots” and they’ll have the chance to prove their teamwork and robotic engineering skills on Feb. 18, when they take their robot to Wilsonville for Round 1 of the 2014 FIRST Robotics Aerial Assist Competition. With support from the NASA Robotics Alliance project, the FIRST Robotics challenge is an international program designed to build self-confidence, knowledge and life skills while motivating young people to pursue opportunities in science and technology. The challenge this year consists of two teams of three robots each trying to outscore the other team by directing a large inflatable ball into goals set at ground level and at six feet above the arena. A blend of soccer and basketball skills are required for the robot to score points during each 2.5-minute game. Points are also given for passing the ball and assisting another robot to score. 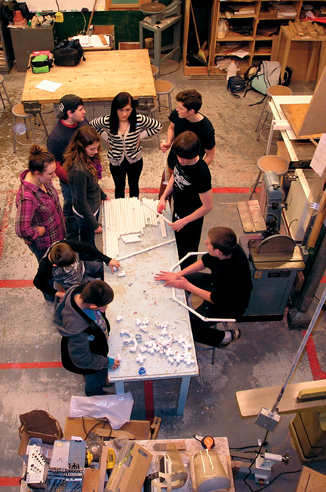 The students have done all the design and assembly on the prototype and will finish it on their own. They all are earning extracurricular credit for their work on the project. Sophomores Lily Beck and Noah Alley are the only team members with experience in robotics competition. Beck was at Thurston High last year when their team competed in a smaller league, and Alley has been to the OSU Leho Camp, where they built smaller versions of the larger robots in the FIRST competition. “We also need to market our team in order to be part of an alliance, and live up to FIRST motto of ‘gracious professionalism’,” said Beck. Senior Scott Sinclair was described by his colleagues as being the brains of the team. The team works collaboratively and makes decisions by consensus, a process that has gone smoothly according to sophomore Angel Ferrell. The youngest team members are middle-schoolers Hunter Davis and Joseph Drexler. 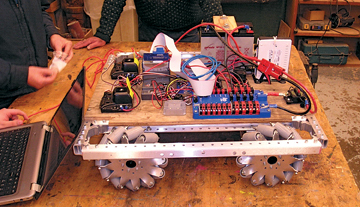 “I just liked the idea of making and building robots,” Davis said. The Lakerbots may place their pride on the line when their robot enters the arena, but they’ll also have a chance to earn college scholarships offered by Oregon State University, Pacific University, Portland State University, the Oregon Institute of Technology and the University of Portland. Last week they received some experienced help from the Triangle Lake community, as local residents Spencer Hollinger brought his experience with software and Fred Burkert lent his expertise in fabrication. 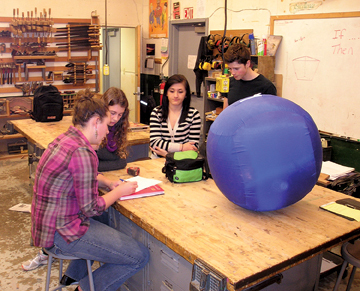 They joined Industrial Arts teacher Darrell Rothauge and the school’s IT consultant Sam Robinson to try and solve a communication problem between the electronic devices that control the robot’s movement. Once the robot is complete, Rothauge plans to have the team demonstrate it at halftime of a Laker basketball game, where all students and the community will get a first look at their newest school athlete. Team member Makena Pennel is posting progress reports and photos online in a Lakerbot blog she created at lakerbot.weebly.com. Rob Lafferty lists 'former newspaper reporter and editor' as just one of many items in a strangely diverse resume. He works from home in the Coast Range near Triangle Lake, doing print production for local publications, writing political commentary for Allvoices.com, and generally hanging out in the woods with his wife Karen and their family of dogs.